Mahjong Titans game is a solitaire game which is played using colorful tiles instead of using cards like in FreeCell game in Windows. I want to show players how to play Mahjong and how to create a successfull Mahjong strategy to solve this Windows 7 game. The object of this Windows game is to remove all tiles existing on the layout. The goal of the game is to pair all matching Mahjong tiles (144 tiles) in the shortest time with maximum score. 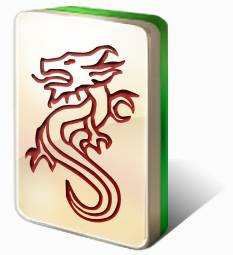 This excellent Windows Mahjong Titans game is developed by Oberon Games for Microsoft. If you are looking for free Mahjong download for Windows 10 or for Windows 8, please read Download Mahjong Titans Game on Windows 10. 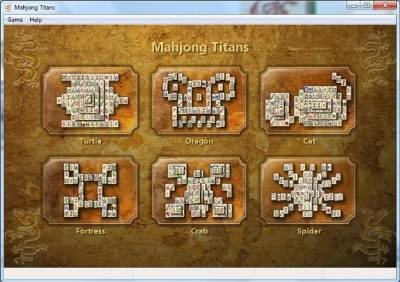 Mahjong Titans is first build as a game Mahjong for Windows Vista. Users who have not installed Windows Vista after Windows XP, are first seeing this wonderful game with Windows 7. Windows Vista or Windows 7, no matter which OS you are using the Mahjong rules are same everywhere. You see the game is simple and very enjoyable. But when you start gaming you will realize it is not so simple to finish every game. Some tiles may be impossible to solve also. So you should build your own strategy to get a better performance in Microsoft Mahjong Titans game. There are six tile layouts for Windows gamers to choose among for Windows 7 Mahjong Titans game. I believe there is a slight difference in Mahjong Titans difficulty levels of these six layouts. 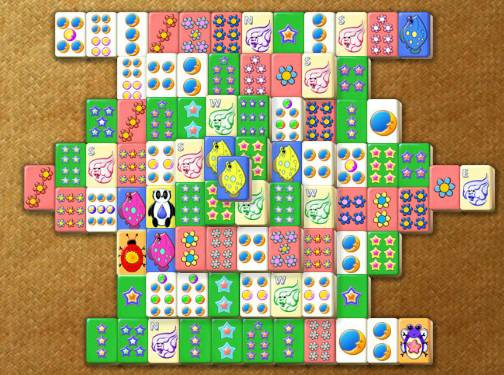 But we can't say these six different layout represent six different difficulty levels in Mahjong Titans Windows 7 game. All available six Mahjong Titans layouts have 144 tiles on the game board. Besides there are three basic tiles and four special tiles in Windows Mahjong game. These 3 basic tiles include Ball, Bamboo, and Character tiles. These basic Mahjong tiles are numbered from one to nine. Besides basic tiles there are 4 special tiles too. These special tiles include the Winds, Flowers, Dragons, and the Seasons tiles. Some of these special tiles are marked with letters. 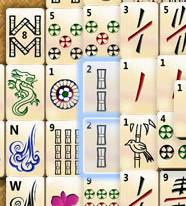 A blue Mahjong Winds tile with marked letter N. Mahjong Wind tiles will give you a lot of points when you pair them. A Flower Mahjong Titans tile. I like the Mahjong flowers. They are more beautiful than each other and gives a lot points and bonus when the player makes a pair from Mahjong flowers. Which is your favorite Mahjong Titans game layout? Which layout do you think is easy to solve? After we have introduced the Mahjong Titans board, the tiles used in this Windows 7 game and the layout, we can continue to talk and learn about the Microsoft game Windows Mahjong Titans rules. You will remember the aim of the game is to remove all Mahjong tiles from the game board. In order to move tiles, gamers should pick Mahjong tiles in pairs. Each tile pair must exactly be a match of each tile in the pair. Of course there are exceptions of this rule. You can match any flower with another flower tile. You can also match a seasons tile with another seasons tile. There are the two exceptions of the matching tile Mahjong Titans rules in Windows 7 Mahjong Titans game. Of course besides pairing tiles rule, each tile you attempt to select must be free to move. What is a free tile in Windows Mahjong Titans game? If you can move a tile without effecting other tiles then this means the selected tile is free. For example, you can not move a tile which is under another Mahjong tile in the tile pile. In short, gamers can only move the Mahjong tiles on the top of the tiles pile or on the left or right sides of the pile. The Mahjong tiles which are under other tiles or stuck between other piles can not be played so can not be a pair with a free tile. In order to play with a stuck tile, gamer has to free tile by removing tiles around the stuck tile by making them pair with others. If you click on a Mahjong Titans tile which is not free, you will be warned with one of the below "Tile Blocked" messages. Tile Blocked : You can't select that tile until its left or right side is free of the other tiles. Tile Blocked : You can't select that tile until you clear the tile on top of it. If you are a gamer looking for Microsoft Windows Mahjong Titans tips and tricks, let's start with basic tips. The first tip to solve Mahjong Titans is, if you stuck and can not find any matches check the bottom left corner of the game screen, there you will see the number of available matches. Here is another hint for gamers, if you press H, Mahjong Titans will point a matching pair for you. You can also ask help from Microsoft Mahjong game to find match of a specific tile. If you right click on a specific Mahjong tile, the match of the tile will be highlighted for you to choose. These two are very similar Mahjong Titans tricks. The general Microsoft Undo keyboard shortcut works successfully in the Mahjong Titans game too. By pressing Ctrl+Z your last move will be turned back to original status. But 3 points will be deleted from your overall Mahjong score. For maximazing Mahjong Titans score you earn, you can try to gather bonus points as well. For example, if you pair two identical Mahjong tiles with same pattern and number or letter in the same row, you get extra bonus. As an additional point, I want to answer the common question among Mahjong game players "Are all games in Mahjong Titans solvable ?" or "Do all Mahjong games have a solution ?". My answer to this question is absolutely NO. I do not believe every game has a solution. How better you play or how good you are at playing Mahjong games, when two tile pairs reside on top of other, there is no way to solve this tiles distribution. Actually, to force the game for a solution, at tile distribution time at the beginning of the game, the programmer must have checked each tile not to be stucked by other and the opposite to be true. I did not read or hear from Microsoft or Oberon Games that the opposite is true. So hope your game has a solution, and be wise to find that solution on the Mahjong board. Windows gamers can also read the game review for Mahjong strategy on Windows 7 Mahjong Titans in order to choose the right strategy for high scores, for finishing the game successfully and for best game statistics. If you get bored of the traditional Mahjong Titans board appearance, use the Game menu (Alt+G) and then click on the Change Appearance menu item. 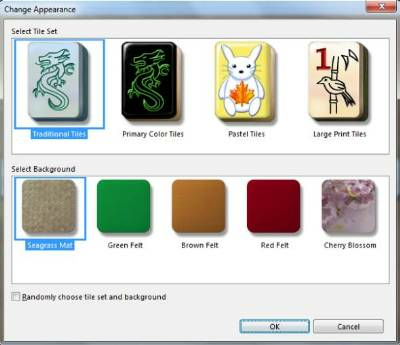 This menu selections will let you customize Mahjong Titans layout, change Mahjong tile set and the game background. Here are default Mahjong Titans game tiles list. The most interesting Mahjong Titans game tiles set is the Pastel Tiles. As you will see from the above screenshot Pastel Tiles set is designed especially for kids. Tiles with backgrouns in pastel colors with cute images on tiles, Pastel Tiles is very popular between children. The cute images contains stars, moons, flowers, nice animal images with my favorite winds tiles. Primary color tiles includes traditional tiles but only in primary colors like black, green, blue, red, yellow and pink. Large Print tiles is for players like me who has difficulty to see Mahjong tiles and can mix numbers or shapes on tiles. Large print tiles enables players to see the tile images easily because there is only a big sized number and single image on every tile. But as far as I see, the default background and the default Mahjong tile set is the most common one among Mahjong Titans game players. I don't know what you think for yourself. If you don't see Windows Games folder or no Windows games including Mahjong Titans in Windows Games folder, then probably Games are turned off or disabled on your computer. This is a very common complaint with Windows Vista Professional or Windows 7 Professional edition users. By default, Windows Games are not turned on or enabled on Vista Professional or Windows7 Professional editions. If you have Mahjong Titans but experiencing other problems with the game, then I can again suggest Windows users to turn off games and then turn on Windows games back before taking any other action. For more detail and instructions please read the guide about How to Turn On Games on Windows 7. If you are looking for a new Mahjong game on Windows 8, you can download and play Mahjong Deluxe, one of the best Mahjong games for Windows 8.